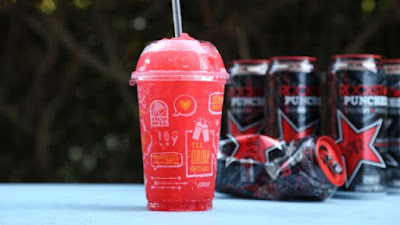 Taco Bell adds the new Rockstar Punched Freeze to their icy slush drink rotation. Available for a limited time, the new flavor is a caffeinated fruit punch-energy drink flavor with 92mg of caffeine per 16-oz cup (compared to 45mg for a similarly-sized cup of Coca Cola). With the addition of the new Freeze, Starburst Cherry has been removed from the menu. The current rotation includes Rockstar Punched, Mountain Dew Baja Blast, and Starburst Strawberry. The suggested price for a 16-oz cup of Rockstar Punched Freeze is $2.49.